These specially designed wipes are enriched with natural ingredients to cleanse and protect your skin. The Aloe Vera is soothing and great even for sensitive skins while the olive oil and vitamin E protect the skin from the harsh elements. 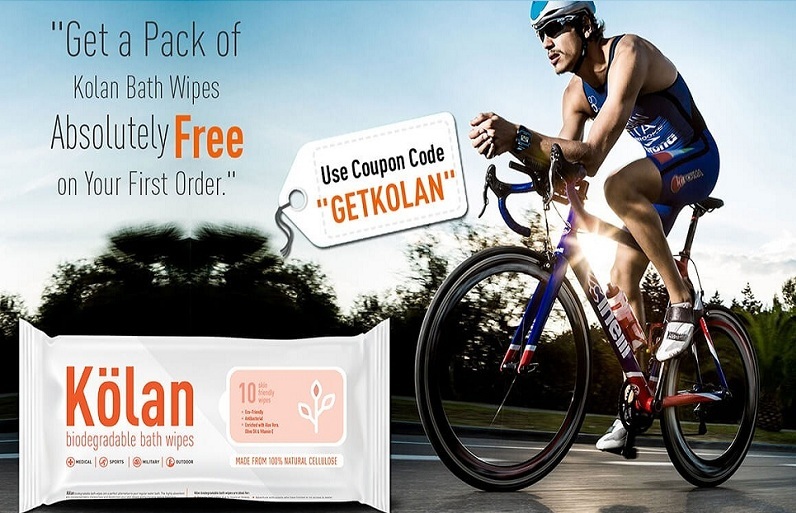 Kolan biodegradable bath wipes are a perfect alternative to your regular water bath. The highly absorbent pre-moistened fabric moisturizes and deodorizes your skin deeply, giving it a long-lasting freshness. These dermatologically tested wipes provide refreshing and hygienic waterless cleaning to the entire body making them your ideal companion where water bath is not possible. It is 100% safe & suitable for all skin types. If you come across any skin irritation kindly discontinues its usage. It is made from 100% natural cellulose fabric and enriched with Aloe-Vera; Olive Oil &Vitamin E. What makes us unique? •Made From 100% Natural Cellulose Fabric •Eco-Friendly and Easy Disposal •Antibacterial •Aloe Vera, Olive Oil & Vitamin E •Free of Harmful Alcohol, Parabens and Rinse Free •Highly Absorbent Fabric (80 GSM) •Allows Ecologically Safe Disposal •Eliminates Bad Body Odours Steps to grab the offer for absolutely free first Kolan Bath Wipe •Visit Kolan Bath Wipes product page by clicking the link http://www.kolan.co.in/products/bath-wipes •Once you reach the shopping cart page after adding Kolan bath wipes to your cart, enter coupon code "GETKOLAN" in the coupon code field. •Then click on the text "Apply coupon code" •Once you click on Apply coupon code your coupon code will be successfully applied, you only need to pay the shipping fees.